Tough as nails, uncompromising and unbreakable, Hilux Rugged X is as rough and ready as they come. It’ll take you pretty much anywhere you’d want to go and bring you back too. ‘Top of the line’ Rugged X has a 2.8lt turbo diesel engine (130kW/450Nm) with more than enough power to get the job done and offers either a six speed manual or auto transmission. I drove the six speed auto with sports shift. 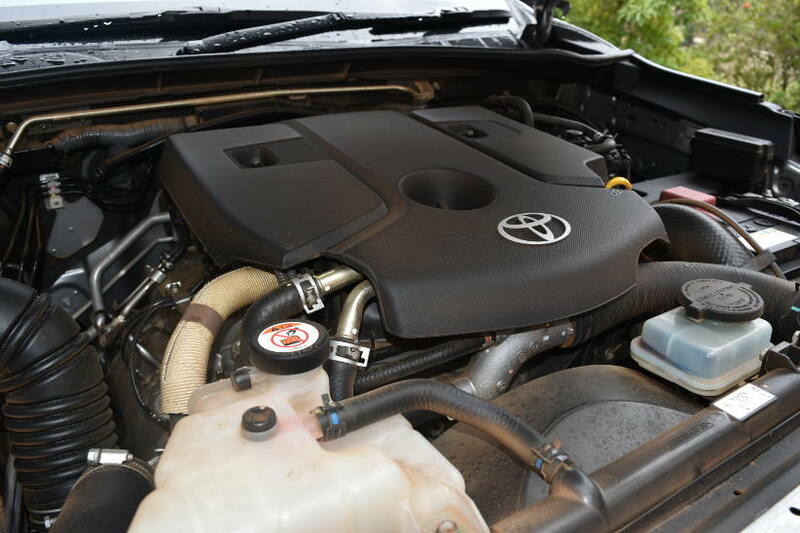 Engine performance is good and it drives equally well either on or off road. Selecting ‘Power’ mode on the transmission ‘livens up’ engine response markedly, with much more kick than you would usually expect from a dual cab diesel ute. Fuel economy is good, listed at 8.5lt/100km. Payload for either transmission spec is 748kg, but if you’re towing (towbar is standard fitment) the auto’s rated for 3200kg braked towing, while the manual’s 3500kg. 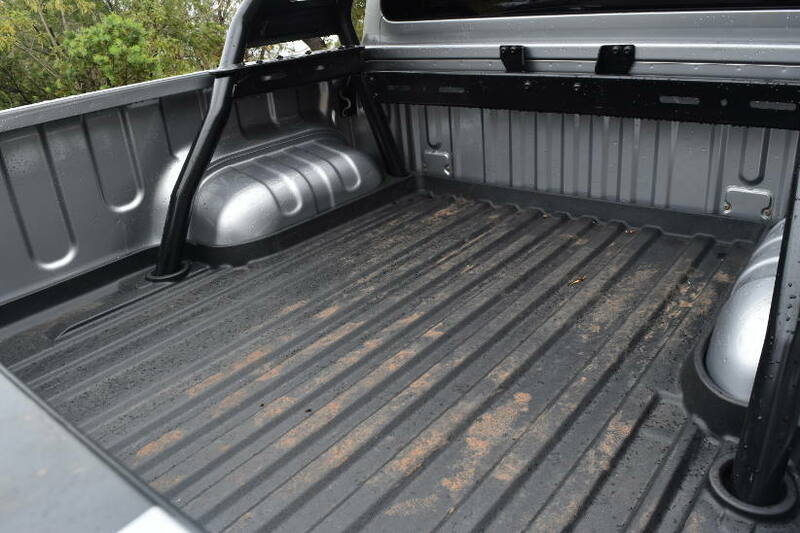 As a 4WD ute, Rugged X is surprisingly comfortable to drive. Riding on 265/65R17 Bridgestone A/T tyres, ride quality, handling and comfort are all quite acceptable. 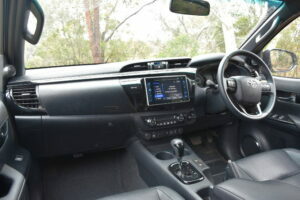 Inside, leather seats (heated in front), climate control and smart key entry/push button start system feature. A six speaker stereo/infotainment system complete with seven inch touchscreen/reverse camera display, controls audio and Sat Nav functionality. Bluetooth and voice control help keep you connected, but Toyota is yet to embrace Apple Car Play/Android Auto. Rugged X offers storage galore inside with dual glove boxes (the top one is actually a ‘cooler box’ for your bottled drinks), large console bin and cup/bottle holders for all, plus two ‘pull out’ cup holders from the dashboard. 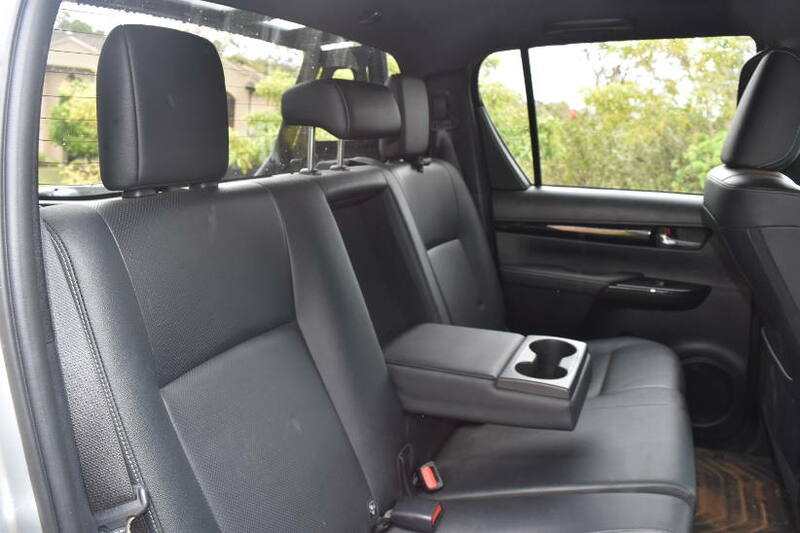 Two 12V sockets and a 220V outlets are provided for front seat occupants as well as a single USB, but rear seat passengers miss out. Country driving at night with the ever present threat of animal strike is always a concern. Bullbars are vital to protect occupants and vehicle in this situation, but can cause additional risk to pedestrians in an accident. 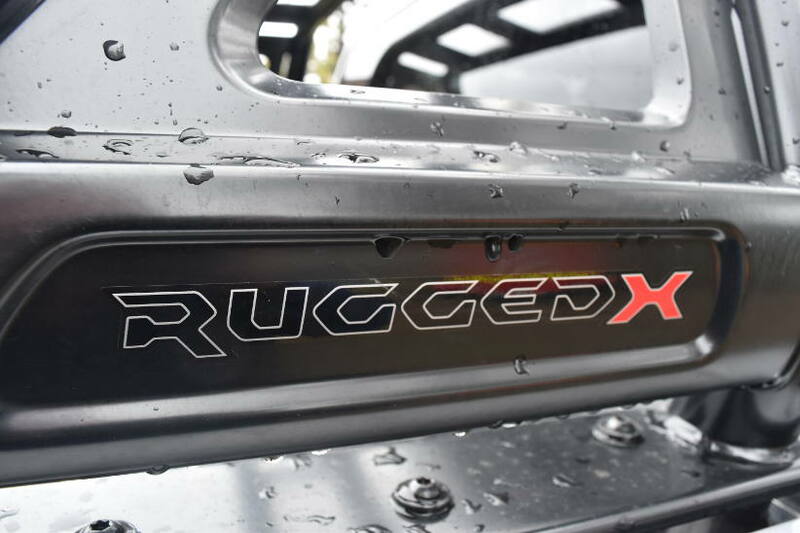 Rugged X’s hoopless steel bullbar, mitigates much of this risk, while still offering protection from animal strike. Additionally, the brilliant integrated LED light bar and ‘spread beam’ driving lights, provide excellent far reaching illumination of the road and verges ahead, for better vision at night. Which is the most effective factor in avoiding animal strike. 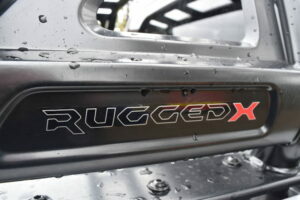 Honestly, if there is a place ‘off road’ that Rugged X can’t get to, you probably shouldn’t go. Clearance angles for Rugged X are 28⁰ approach and 21⁰ departure (affected by standard towbar fitment). Corner approach angle for Rugged X though is an impressive 49⁰. Toyota lists ground clearance for Rugged X is 251mm and for water crossings a wading depth of 700mm. 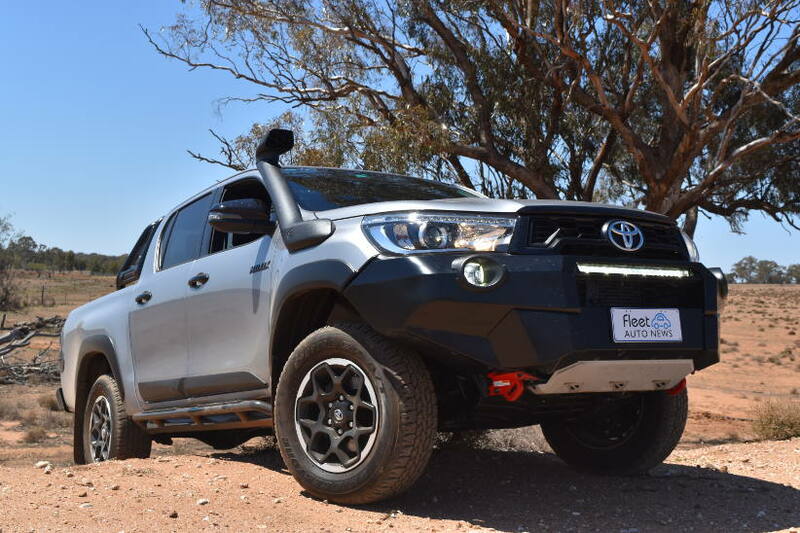 Toyota advises that Rugged X retains the five star ANCAP rating Hilux achieved in 2015. 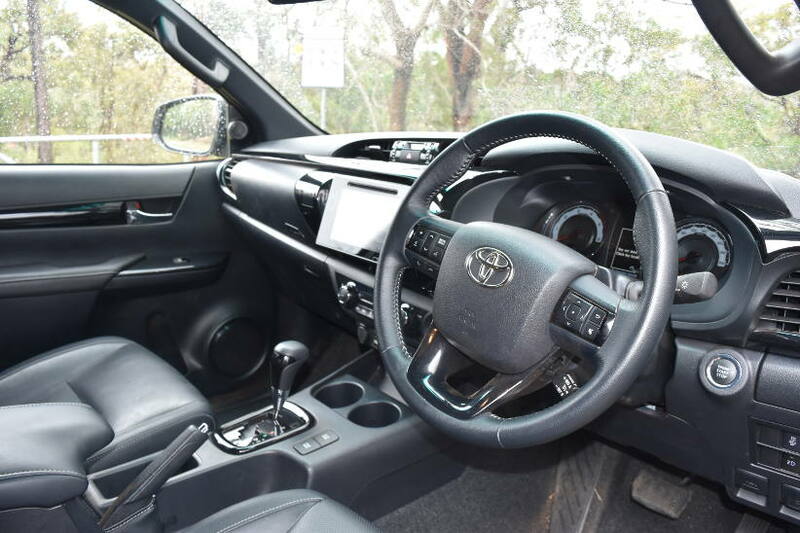 Seven airbags, traction and vehicle stability control, trailer sway control all feature; but Toyota is yet to update the Hilux range with more advanced safety features such as AEB, Forward Collision or Lane Departure warnings as some competitors already do. From January 1st2019 Toyota offers a five year unlimited kilometre warranty on Rugged X, plus capped price servicing. 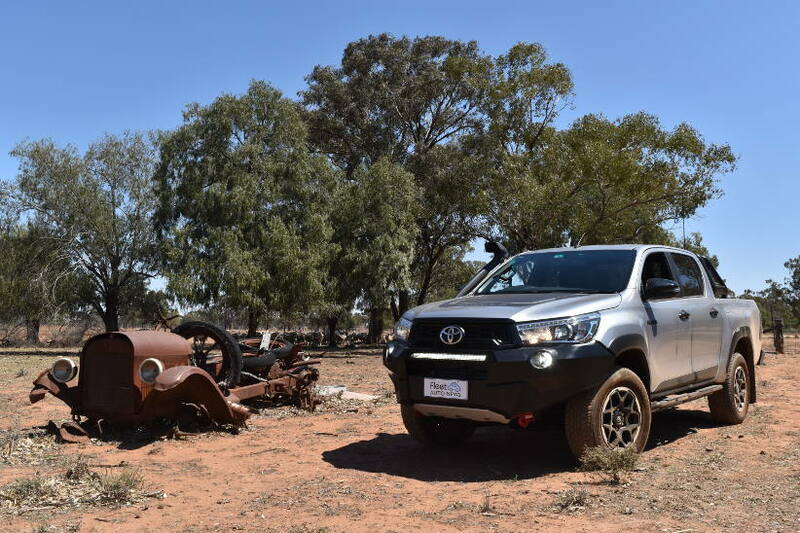 Hilux Rugged X is an exceptional 4WD ute, comfortable enough to live with every day and when it comes to ‘off road’ it’s certainly the Toughest of the Tough.